Think about ever great fall from grace that you have ever seen in sports. A few that come to mind are Tiger Woods, Lance Armstrong, O.J. Simpson and Michael Vick. And the thing that each of those falls had in common was that the infamous incidents which led to each respective athlete’s ‘demise’ occurred off of the playing field in some capacity. Tiger Woods had a cheating scandal. O.J. had a double murder trial. Michael Vick had a dogfighting ring. Lance Armstrong got busted for steroid usage. Never has there ever been a fall from grace as dramatic as these that did not include ‘outside the lines’ influences as the primary source of demise. It has taken all of 6 minutes and 47 seconds for Ronda Rousey to transform from the most dominant athlete in the world to a washed up has-been; and the primary factors for her fall from grace did not occur outside the lines. In just two fights – a second round knockout to Holly Holm that took 5 minutes, 59 seconds and a first round knockout to Amanda Nunes that took 48 seconds – the fighter that Joe Rogan once called, “a once ever in human history fighter” is now done. No, she hasn’t officially retired yet, but Ronda Rousey is done. What I mean by that is that, no matter what she does from here forward, the image of Ronda Rousey has been forever shattered and is done. The unbreakable, unstoppable, “once ever” woman that transcended fighting and had a legitimate case for greatest athlete of all time is done. What we have now is a shell of that woman who simply wants to be left alone. Before I really get into this article, I just want to put this warning out there. I respect Ronda Rousey. I respect all of the work that it takes to reach such a high level. I respect how she has changed the fight game forever and all of the women she has impacted. However, I do not like Ronda Rousey, and that will very clearly shine through here. So if you’re here to read a positive view of Ronda, look elsewhere. I want to start this by staying within the octagon, because that is something that I can at least somewhat factually analyze without too much speculation and subjectivity. Within the octagon, Rousey has always had significant holes in her game. Her biggest calling card has always been her Olympic level judo game. She used her excellence in the clinch and thunderous takedowns to physically dominate opponents, take them to the ground, and transition into her patented arm bar. Her gameplay was foolproof through 12 fights and nobody had even come remotely close to beating her. She tried to strike with three-weight-class world boxing champion Holly Holm and to say it didn’t go well is a vast understatement. Rousey got absolutely destroyed, needing plastic surgery after the fight to keep herself recognizable. And on Friday night, in her grand return fight against Amanda Nunes at UFC 207, Rousey got thoroughly mauled again. If we’re being completely honest here, Ronda Rousey is not a good fighter. She is worse than poor on the feet and does not have a strong jiu-jitsu game. As I said earlier, her one calling card has always been an extremely high level judo game, which she uses to take an opponent down and transition into her one submission. Honestly, it’s amazing that it took 12 fights for someone to figure out how to beat Ronda Rousey. Rousey’s game is comparable to that of a baseball player who’s only skill is stealing bases. Once they get on the base paths, they are extremely dominant and dangerous, but combating that skill is simple; just don’t let that player get on base. Easier said than done, but still simple. As Holly Holm showed last November, if you stuff Ronda Rousey’s initial takedown, she is useless and can be easily picked apart. In both the fight against Holm and Amanda Nunes, Rousey looked like an underprepared and untrained athlete attempting to get in the cage with seasoned strikers. After her initial run of dominance, the fight game caught up with Ronda Rousey. She had no answer and was unable to adapt or adjust her game to match up with the game that had caught up with her. Great fighters make adjustments, and Ronda simply continued to stubbornly work her past game plan, and she paid the price for it. One dimensional and too stubborn to make adjustments, Ronda Rousey was never a truly great fighter. After 14 fights, we now realize that. Now, I’ve made my case why Rousey isn’t a good fighter, but I’m gonna take it one step further here. Ronda Rousey is not a great athlete. Whoah whoah whoah, hold on a second. How can I say that an Olympic bronze medalist who dominated women’s MMA for over 4 years isn’t a great athlete? I can say it because all truly great athletes know how to deal with adversity. Ronda Rousey let one loss break her. If I’m supposed to believe everything that I’ve ever heard from people trying to motivate me, how you deal with success is not what makes you great; it’s how you deal with failure that separates the average from the great. 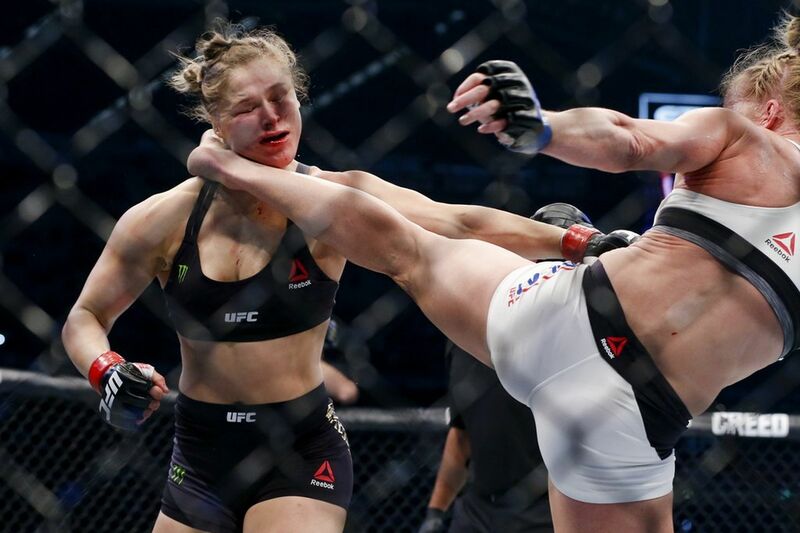 And when Ronda Rousey faced the greatest failure of her entire life, she let it break her in humiliating fashion. She spent a year away from fighting, cooped up in Idaho with just her boyfriend, Travis Browne, there to keep her company. She avoided all media except for a hefty paycheck from Ellen DeGeneres and talked about how she had contemplated suicide after her loss to Holly Holm. Suicide?! Are you kidding me?! Please, tell me any other great athletes that have admitted to contemplating suicide following a big loss. Can’t think of any? It’s because every truly great athlete that has ever lived knows how to deal with failure. Ronda Rousey chose to sit and pout in Idaho for nearly a full year before deciding to make a comeback. Now, the story of Ronda Rousey could be far from over. She could prove all of my words wrong and humble herself by coming back to the UFC, accepting a non-title fight against an opponent of far less significant stature, and try to pick up the pieces of her career. This could be just the beginning of a comeback story. Instead, Ronda Rousey will choose to quit. She’ll let two failures define her and she will quit mixed martial arts. Now, I can understand quitting because you don’t have anything left to give. Miesha Tate quit the sport because she said she, “doesn’t care enough anymore.” That’s completely understandable. But, if I’m supposed to believe everything that I hear, Ronda Rousey is going to quit martial arts because she cares too much. My goodness, there’s a lot to unpack about that statement. Firstly, as an “average person” myself, I believe I can speak on behalf of the people that Ronda’s dear mother is belittling in this statement. Yes, we get it, your daughter cares about her sport. Yes, we also understand that losing is hard – everyone has lost and knows the feeling. Yes, I can understand that I, an “average person” may not be able to understand just how deeply Ronda cares about mixed martial arts. But really? Am I really supposed to believe this? Now, are you gonna tell me that Dominick Cruz enjoys losing? Am I supposed to believe that anyone who can, “shrug off a loss” enjoys losing and can’t “wrap their head around” the extent to which a professional athlete cares about his profession? Let’s take another fighter for example; Jose Aldo. In December of 2015, Aldo suffered the ultimate humiliation at the hands of Conor McGregor. For months leading up to the fight, McGregor belittled and taunted Jose to the point where Aldo seemed legitimately infuriated, yet Aldo remained quiet and insisted that he would let his fighting do the talking. Then, on fight night, McGregor knocked him out in 13 seconds, took Aldo’s featherweight belt, and handed Jose his first loss in over 10 years. Also was clearly devastated. He went into hiding for several months, yet collected himself and vowed revenge. He didn’t hide away and wallow in his sadness, avoiding all media. He sought out another fight to prove his greatness and swore that he would get his retribution someday. Aldo’s comeback culminated with a convincing win over Frankie Edgar at UFC 200 to reclaim his featherweight belt, and while he continues to wait for his next chance at McGregor, Aldo has reminded the world of his greatness and proved that one night in December of 2015 was just an outlier. But, if I’m supposed to believe Ronda Rousey’s mother, those two men’s ability to not be so totally and completely broken by their losses equates to them not caring about mixed martial arts to the extent of Ronda Rousey, and I just plain refuse to believe that. Ronda Rousey never won with grace, and she doesn’t lose with grace either. Which extends into my last and final point, the fact that Ronda Rousey is no longer a role model that I want my future daughters to look up to. What she has done for women’s MMA and women all over the world is undeniable. She broke barriers, stereotypes, and paved a way for women in combat sports; and I barely even scratched the surface of her global impact. In that right, her legacy is secure. However, role models that I want my future daughters looking up to know how to deal with and fight through failure. The women in this world with true strength and true grit have been knocked down one million times and have gotten up one million and one times. Ronda Rousey has been knocked down twice now, and instead of getting up, she’s curled up in a ball and told us to leave her alone. It’s a powerful and poignant example of how not to deal with failure. And, one last thing. Yes, I’m a clueless member of the media who is criticizing an athlete with a job much tougher than I could ever dream of, and I know that this will simply infuriate LeBron James and Jon Jones and Kobe Bryant, among all of the other athletes who can empathize with Ronda and encourage her to keep fighting and get back up. But that’s what Ronda gets when she hides from the media. We get to make up our own storylines and narratives. The queen is dead, and she’s not rising. Over the course of her MMA and athletic career, Ronda Rousey has become more than just a legend, she has transcended athletics and pop culture to become the most dominant female athlete in the history of ever, and possibly the greatest athlete of a generation. She is beautiful, she is strong, she is mean, she is empowering, everyone loves her; and she had never lost. Not even close, in fact. Nobody could ever beat her, nothing could ever touch her reputation or her record, and nothing was supposed to be able to. On August 21st, when it was announced that 9-0 Holly Holm would be the next challenger to Rousey’s throne, this just seemed to be another piece of raw steak that UFC President Dana White was throwing to his prized lioness. Another squash match to further prove the generational greatness of Ronda Rousey. Personally, I was excited, because Holly Holm – a Jackson-Wink MMA product – not only fights out of my favorite camp, but also is a Cardinal fan and one of my favorite fighters and I was excited to see her finally get the stage to showcase her world class boxing skills. But while Holm is a world class boxer, and I was going around telling people to take her seriously and that she would beat Rousey, I didn’t actually believe she would be able to do it. I didn’t actually believe that Ronda Rousey could be defeated. It was just unfathomable. With one thunderous left high kick to the jaw, history was re-written. From the opening bell, I kept saying to myself, “This isn’t really happening, is it?” Holly Holm was completely dominating. Her left hand was pounding Rousey, landing flush every time she threw it. Rousey couldn’t get anything going; her takedowns were stuffed, her striking was poor, her footwork was off, her signature arm bar wasn’t there, and she just kept walking right into Holm’s dynamite left hand. After decisively suffering the first lost round of her career, Rousey came out early in the second round completely winded and looking lost. 55 seconds into the round, Rousey’s legend came crashing down to the center of the octagon just as hard as her motionless body did following a brutal left high kick right on the jaw that ended it all. My eyes gaped wide open and my jaw was dropped. I literally couldn’t believe what I had just seen. The untouchable Ronda Rousey, the modern day Mighty Casey, was lying lifeless in the middle of an octagon, broken and defeated. 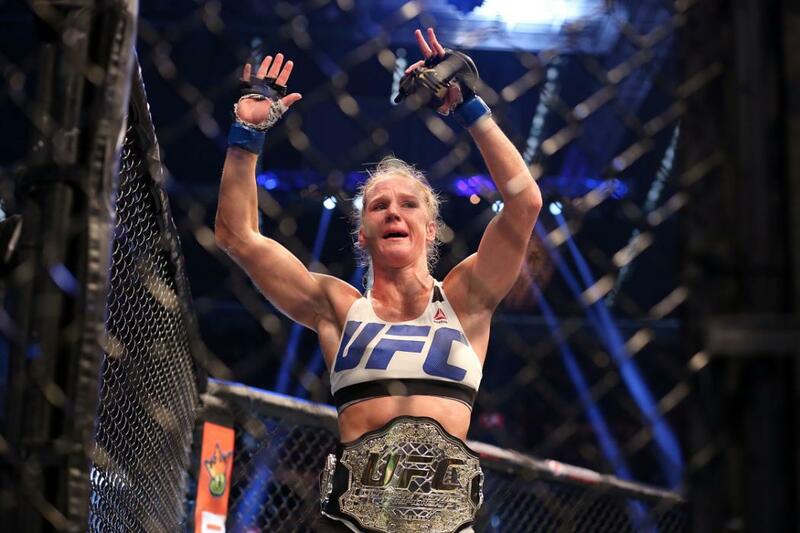 It was only when Holly Holm’s hand was actually raised, and an obviously shaken Dana White – who had just watched his most marketable athlete get destroyed – was actually put the bantamweight belt around her waist that reality set in. As I said earlier, history had been rewritten. This was Tyson-Douglas reborn, only in that matchup Buster Douglas didn’t completely and totally dominate Mike Tyson so badly that people were left wondering if he would ever be able to come back from the defeat. In my few years of watching fights, the biggest upset I’ve ever seen was Chris Weidman knocking out a cocky Anderson Silva. But in that fight, Silva was 38 years old, clearly past his prime, and Weidman caught him with one shot that put the lights out. It seemed to be really fluky. This was no fluke, and this was no flash in a pan. This was a complete and total annihilation reminiscent of the type Rousey is used to dishing out. Take no credit away from Holly Holm, she came in with a perfect game plan and executed it perfectly, but Ronda Rousey failed absolutely miserably for the first time in her career. In her MMA career, Rousey had been out of the 1st round once, and in that fight she was completely and totally in control over a dazed Miesha Tate who just somehow survived for 3 rounds. Basically, her MMA career had just been a parade of squash matches where she had physically imposed her will and no one has been able to stop her from doing so. 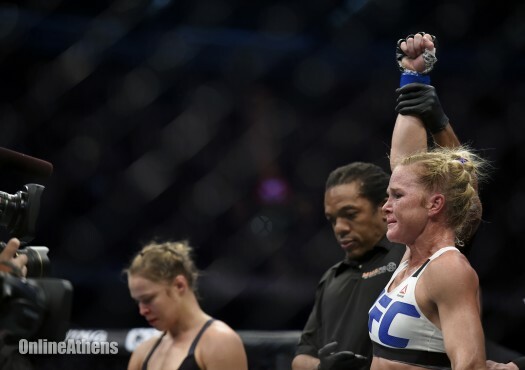 Right off the bell, Holly Holm gave Rousey what she had never had before; a fight. Holm stuffed Rousey’s first takedown attempt, passed her guard, slipped out of her arm bar attempt and got back to her feet. Rousey’s subpar striking ability – which had never been exposed before – was completely and totally picked apart by the world class striking of Holm, who teed off with that dynamite left hand and just kept throwing combination after combination that Rousey just kept slogging right into. Holm continued pounding away on a dazed Rousey, who just looked totally and completely lost when her plan A wasn’t working. 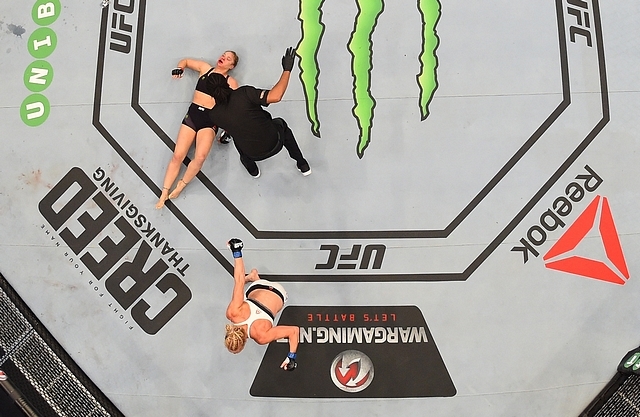 By the time the 2nd round rolled around, Rousey was exhausted and had nothing left. Holm was calm, cool and kept executing her game plan. It was only a matter of time, and really quite difficult to watch. So, to start, when Rousey’s plan A failed, she didn’t have a plan B ready, so she panicked and tried to out-strike a world champion boxer, getting absolutely massacred in attempting to do so. Secondly, Rousey’s subpar conditioning reared its ugly head about 3 minutes into the fight when her footwork became heavy and her hands became slower and she just flat out looked horrible. Thirdly – and the biggest issue of all – Ronda Rousey became a victim of her own legend. The media and the world have built her up into something completely unattainable. She was made into an invincible entity that could never be broken and never falter. And as much as she can try, or tell you otherwise, Rousey got caught up in her own hype. It’s widely known that Rousey doesn’t condition hard or focus on her cardio during her fight camp. When asked about it she commented, “I’m just always in shape for my fights.” Her lack of cardio was exposed against Holm in an extreme way, as Rousey looked totally gassed after just 3 minutes in the cage. Before her fight, Rousey was all over the place, as she is naturally wildly popular. She made appearances on Jimmy Fallon, Jimmy Kimmel, and went on a world tour to promote the fight. 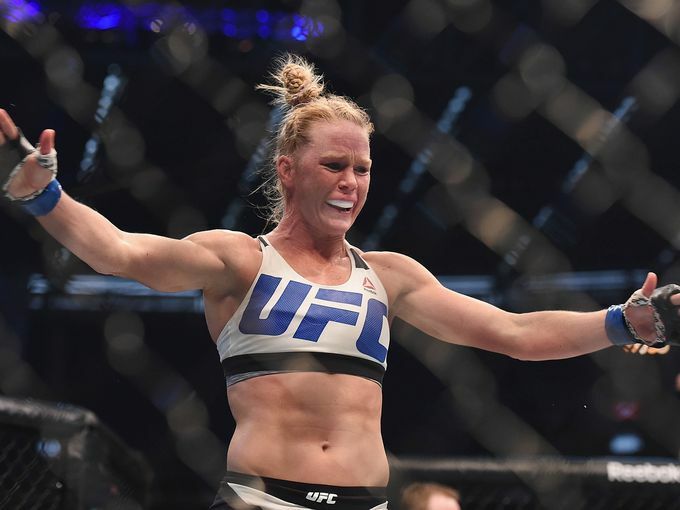 Holm, meanwhile was locked in the cozy confines of her hometown of Albuquerque, New Mexico, completely fixated upon the task at hand of defeating Rousey. In her past camps, Rousey has been as difficult to find as Holm was during this camp, focused upon her task at hand and further expediting her greatness. But this camp was just different. She seemed to take Holm for granted, discussing her future on a consistent basis and accepting more public appearances in advance of the fight. Ronda Rousey seemed to believe that her greatness and reputation would be enough to win this fight without her really having to put in the same kind of work that she normally does. And she paid dearly for it. 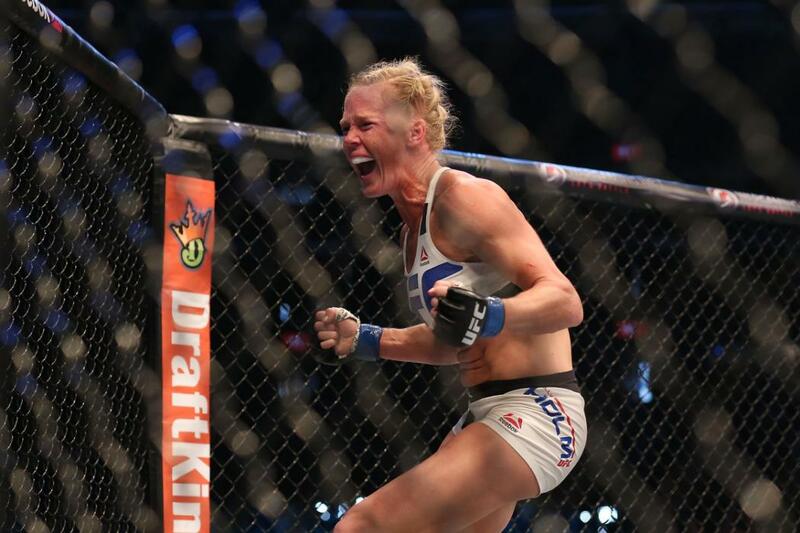 As for Holly Holm, she has secured her place in sports history. This fight transcends MMA, and ranks among the greatest sports upsets in history. This is the biggest knockout in MMA history, and is somewhat akin to the United States Olympic hockey team defeating the Russian machine in the 1980’s. Holly Holm will now be forever remembered as not just the first woman to defeat Ronda Rousey, but the woman who completely and totally obliterated Ronda Rousey. I’ve watched a lot of sporting events in my lifetime, and a weekend after telling you that I’ve never seen anything quite like what I saw when the Principia soccer team won their first state title, I will once again tell you that I have never seen anything like this in my life and will never see anything like this ever again. This was a literal David and Goliath story, and a perfect example of why fight fans are fight fans. Because we never know what could happen. 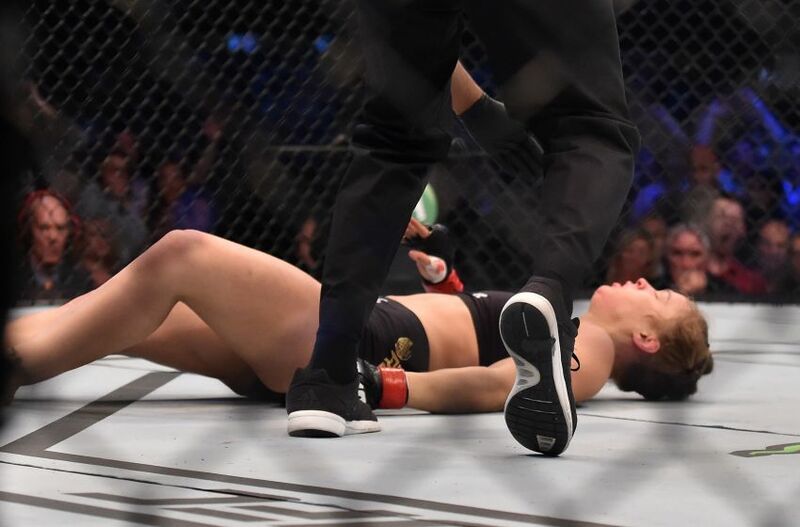 As James Earl Jones’ character said in The Sandlot, “Heroes are remembered, but legends never die.” And let it be remembered, that on November 14th, 2015, the legend of Ronda Rousey came crashing down to the ground as hard as Holly Holm’s left leg came crashing into Rousey’s jaw. History was re-written, and I can promise you that you’ll never see anything like this ever again. The mighty Rousey has struck out. See you all in December at UFC 194. Let me take you back to a different world for a second. Twenty years ago, for those deficient at math, was 1995, and as I teased above, the world was a very different place. The most popular song of the year was ‘Gangsta’s Paradise’ by Coolio. The most popular movies were Toy Story and Braveheart. Mel Gibson was still wildly popular and wholesome, and the members of One Direction were still wearing diapers. Now, why am I bringing up the year 1995? Because it was the year a young kid by the name of Kobe Bryant made his NBA debut straight out of Lower Merion High School in Ardmore, Pennsylvania. Wednesday night, Bryant completed his return from a scary shoulder injury to make his 2015 season debut and become the first player in NBA history to play 20 consecutive seasons with the same franchise. I just want you guys to let that number sink in for a second. Twenty years going to work for the same employer is pretty remarkable in and of itself; but particularly in the NBA, where rosters are small and extremely competitive, money is king, and even Michael Jordan couldn’t stay with one team his whole career. Kobe Bryant has been playing basketball at the professional level for longer than I’ve been alive. In fact, the team his Lakers played Wednesday night had two starters – Andrew Wiggins and Karl Anthony-Towns – who weren’t even born yet when Kobe made his debut. And when we start diving into the legacy of Kobe Bryant, one thing really stands out to me. There are few athletes in the world that are commonly identifiable just by their first name. LeBron James and Tiger Woods immediately come to mind, but their names aren’t nearly as universally recognizable as the name, ‘Kobe’. Every little kid that dreams of playing in the NBA has visions of himself as Kobe Bryant at some point or another. 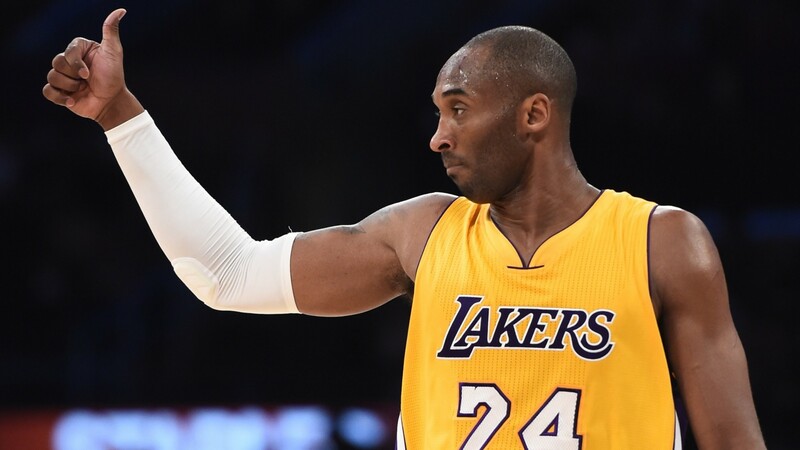 ‘Kobe’ has just become a term that is synonymous with tireless work ethic and basketball greatness. And now, I think we should add another word to that list; loyalty. For all the faults he does have, Kobe Bryant’s fierce loyalty should be revered and looked up to by kids everywhere. Many athletes talk about how loyal they are or how much loyalty matters to them, but none of them can really identify with it on the level Kobe can. There has never, in 20 years, ever been serious talk of Kobe playing a single game in a jersey that didn’t say, ‘Lakers’ on the front of it. Kobe has remained true to the team that brought him into the league and gave him a chance, he has remained loyal to the hand that feeds him, and that is to be greatly admired. So again, for all his faults and all his mistakes, Kobe Bryant is a truly special athlete that we have had the great pleasure of enjoying for these past 20 years; and one that will be remembered for far more than just the next 20 years. 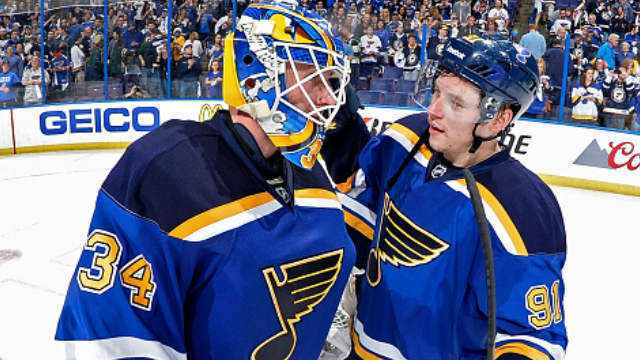 Following another brilliant performance at home last night by Jake Allen, the Blues goalie debate rages on. Elliott or Allen? The grizzled and proven vet or the young, talented up and comer? Following a rough start to the season in which he gave up 3 goals in each of his first 3 starts, Allen has backed up a 27 save shutout over Tampa Bay on Tuesday night with a 23-24 performance in a win against Anaheim last night. Meanwhile, Brian Elliott hasn’t looked particularly sterling either, sporting a mediocre 2.18 GAA and having been bailed out by a terrific offense so far this season. But with injuries to Paul Stastny, Jaden Schwartz and Kevin Shattenkirk, the Blues’ offense has significantly – and expectedly – slowed in the recent days. So which goalie does Ken Hitchcock roll with as the primary guy in the coming weeks? Or does he even bother ‘naming’ a #1 goalie and just keeps splitting playing time like he has been? For my two cents, Allen is the starter and the Blues need to push all their chips to the center of the table on him. He’s younger, more confident, more athletic, and, for my money, won the job down last season’s stretch run and into the playoffs. Being an elite goalie is as much about confidence as it is about skill level. And over the course of the past 4 or 5 years, the Blues have so poorly treated Brian Elliott that I can’t help but feel his confidence is totally shot and he can never be the borderline elite goalie he once was in St. Louis. Having Allen, and now Pheonix Copley waiting in the wings, allows the Blues to make Elliott expendable, and I think they owe it to him to give him a fresh start somewhere where he can be the de facto starter. So put all your chips to the middle of the table with Jake Allen, give him the vote of confidence, and look to deal Elliott to a team in desperate need of good goaltending. Offer him to Edmonton, a team in desperate need of a franchise goalie, and see if you can pry away a guy like Ryan Nugent-Hopkins, who could use a fresh start and might thrive in St. Louis. Stop trying to please everyone with the goalie situation, there are going to be hurt feelings either way, so you might as well got a solid player back in return for them. Jake Allen should be the guy, see what Brian Elliott can fetch on the open market, and let bygones be bygones. Please and thank you. I’ll get into this in greater detail later, but does the NSAC make sense to anyone? Yesterday, the Nevada State Athletic Commission handed down a two year suspension to Rousimar Palhares for his repeated eye gouges and for not letting go of a submission during his welterweight title fight against Jake Shields at WSOF 22. Palhares has a history of not letting go of submissions, and being a really dirty fighter, so this suspension seems just and Palhares can deal with it. But, where my questions come in is that this suspension comes about a month after the NSAC handed down a 5 year suspension to Nick Diaz. 5 years?! Holy crap what did he do, kill someone? 5 years is a seriously long suspension. 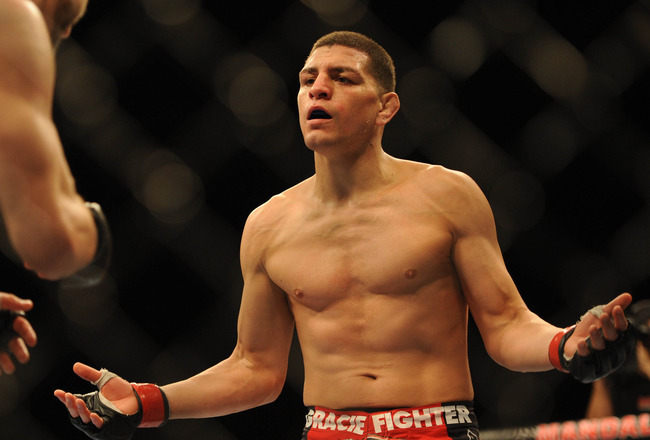 Nick Diaz got a 5 year suspension for testing positive for marijuana. MARIJUANA, the thing that is now legal where Nick Diaz smoked it. Without going into complete details, smoking weed is virtually harmless. There were no marijuana related deaths in 2014 and I have never in my life heard of marijuana fueled violent acts. Marijuana and MMA just have no connection and aren’t dangerous whatsoever. Meanwhile, Palhares is deliberately attempting to hurt people, and has in the past. What Palhares is doing in MMA is worthy of a long suspension, and he has gotten his justice. But 5 years and a $150,000 fine to Diaz vs 2 years and community service for Palhares just makes absolutely no sense. Stay tuned tomorrow for my rant on the NSAC, but for now I just ask them to take a long, hard look in the mirror and realize what they’ve done; because it literally makes no sense to anyone and has the look of a vigilante group more than a governing body for sporting events in Nevada. Editor’s note: I apologize for my absence yesterday. At the end of the day I am still a high school student with a lot of other responsibilities, and unfortunately my homework and college applications have to take precedence over my outside writing. So I apologize for my absence yesterday and I will try to be better at balancing my work in the future. Thank you for your unwavering support of me because you are truly the reason that I write. Thank you always for reading me.